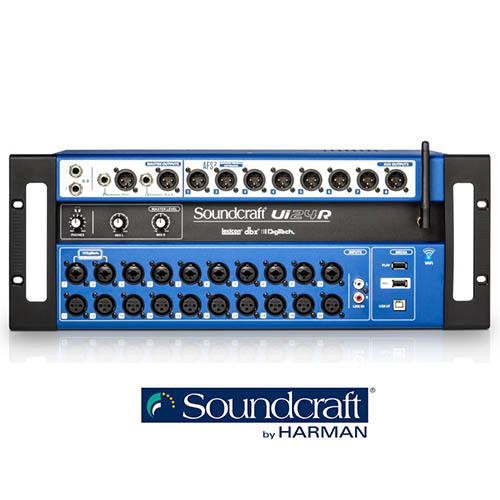 The Soundcraft Ui24R is a complete, rack-mountable, digital mixing and multi-track recording system that delivers flexible I/O, pristine sound quality, intuitive wireless control, and roadworthy reliability – all in a streamlined design. The system can double as a stagebox and can be controlled by up to 10 devices via Ethernet or built-in dual-band Wi-Fi, making it possible to control mixing and multi-track recording wirelessly from anywhere in the venue. Renowned Lexicon, dbx and DigiTech signal processing ensures pristine sound, while 20 Studer-designed microphone preamps deliver more professional inputs than any other mixer in its class. The compact, rack-mounted Ui24R is also compatible with the new HARMAN Connected PA system, and offers unprecedented control, versatility and power at an incredible value. From the stage to the studio, Soundcraft Ui24R is the ultimate system for artists, venues and engineers who need to save space and deliver superior sound.